fill in the form and hit "Submit". Your boat will be added asap. ** To add a photo(s) to your listing, e-mail me a .jpg file. 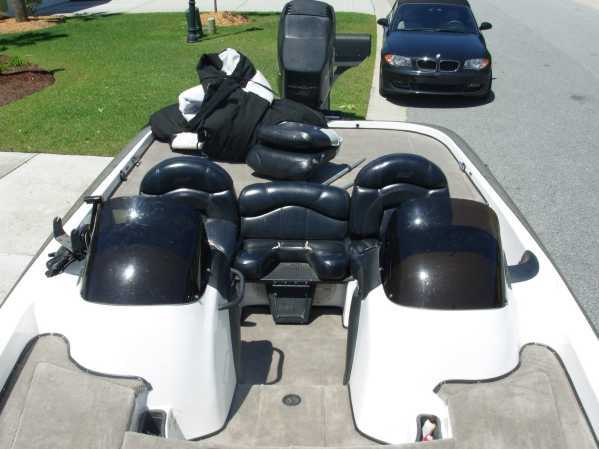 04 200 Merc 23 Tempest, two Lowrance HDS8's, Motorguide Digital Tour. 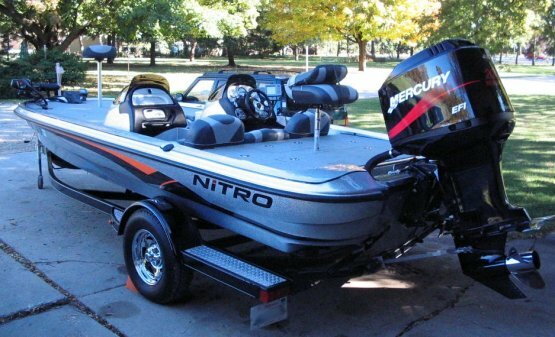 97 150 Merc EFI 25 Trophy Plus, Lowrance X96, HDS5, Motorguide 70# 24V. 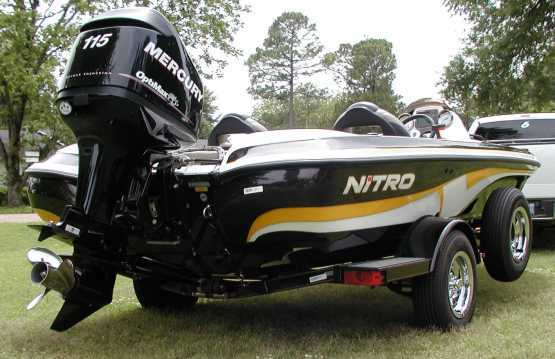 01 225 Merc EFI 25 Tempest, 10" Slidemaster, Lowrance LCX18C, HDS10, Motorguide Digital TR82. 71 mph @ 5900 rpm (gps). 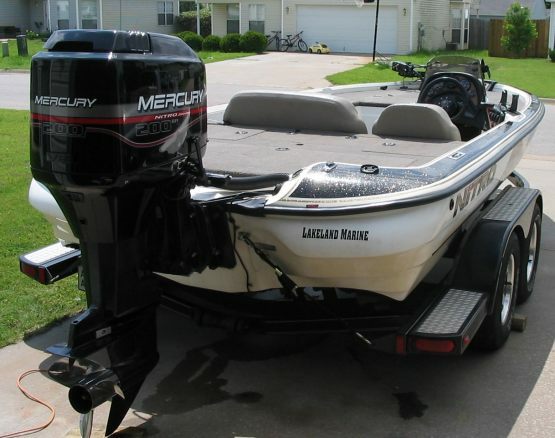 11 150 Merc Opti Lowrance Elite 5, Mark 5, Motorguide Tour Edition 80# TM. 94 140 Evinrude 17 prop, Lowrance electriconics, Motorguide TM. 00 125 Merc Manual jackplate, Lowrance electronics, Motorguide TM. 98 120 Force Humminbird 798ci HD SI, 768, Motorguide Excel 54# TM. 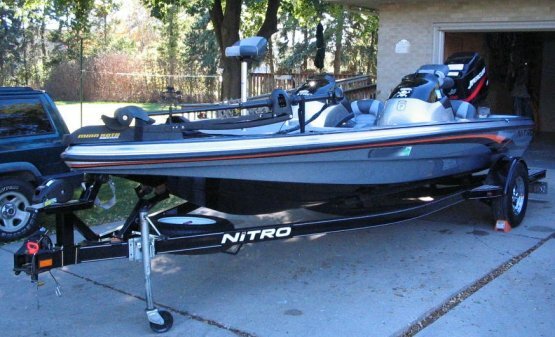 11 150 Merc ProXS 23 Tempest, two Lowrance Mark 5X's, MinnKota 76# TM. 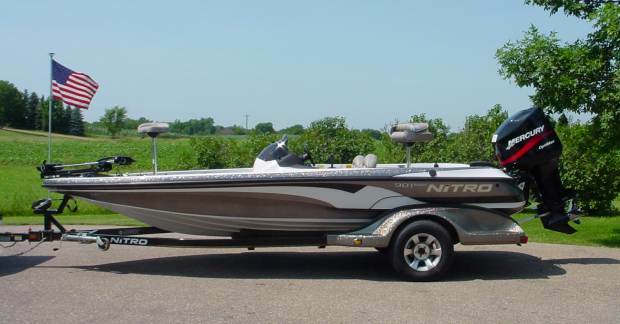 08 150 Merc 23 Tempest, Humminbird 997ci SI, 587ci, Motorguide 70# TM. 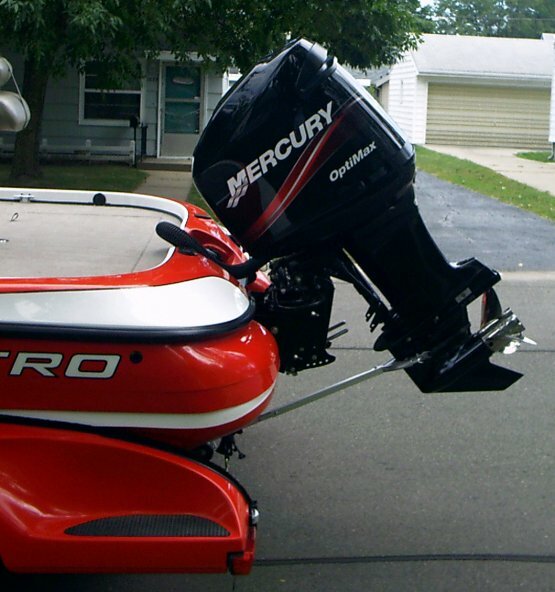 11 150 Merc 24 Tempest, 6" T&H jackplate, Lowrnace Mark5, HDS5, Motorguide Varimax. Propshaft is 3.5" below the pad. 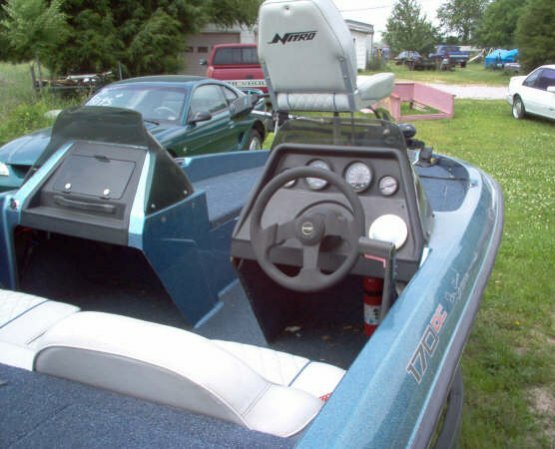 Optimax 24 Trophy Plus, Lowrance X85 bow, Eagle Cuda 350 S/Map at transom, Motorguide 70#. Propshaft is 3.5" below the pad. 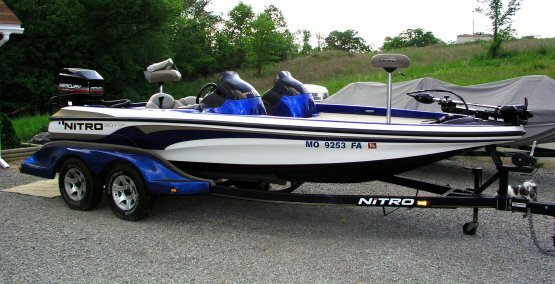 00 200 Merc EFI 25 Trophy, hydraulic jackplate, Lowrance HDS7 w/Structure Scan, Lowrnace HDS5, Motorguide TM. 69 mph (gps). 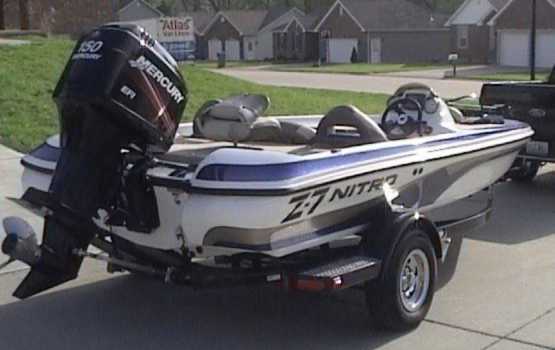 Optimax 24 Tempest Plus, 6" CMC jackplate, Lowrance X510C, X135, Motorguide pro 70#. Propshaft is 3 1/4" below the pad. 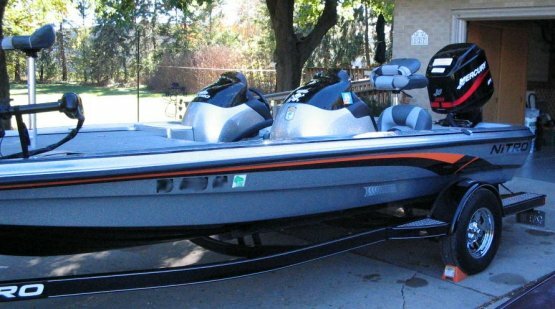 96 175 Merc EFI 25 Tempest, Lowrance electronics, Motorguide TM. 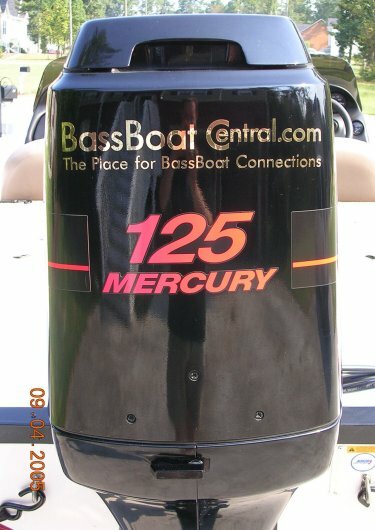 10 250 Merc 26 Fury, 10" manual jackplate, Humminbird 898c si's (2). 06 150 Merc Opti 24 Turbo, Lowrance 520's (2), Motorguide Tour 70#. 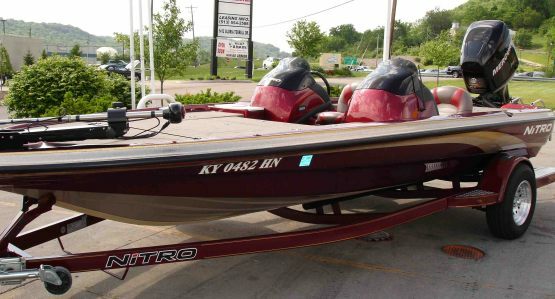 09 150 Merc 24 Tempest, Humminbird 768, 717, Motorguide Pro 70. 09 90 Merc Optimax "Still breakin it in!! (Feb.2010)." 09 175 Merc 64 mph (gps). 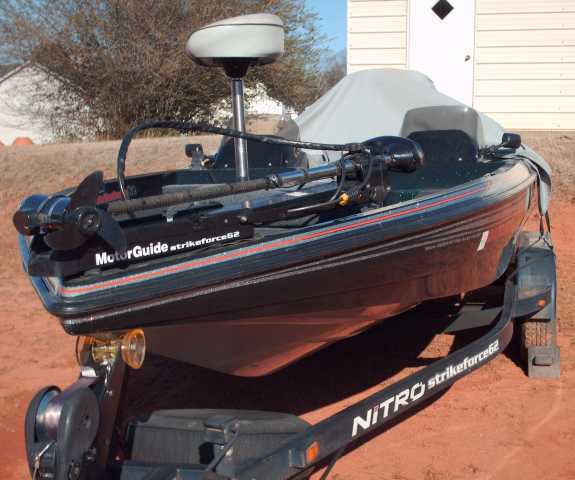 09 150 Merc Humminbird Matrix 17, Motorguide Pro Series 70#. 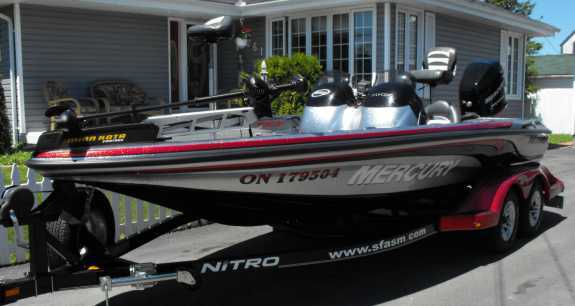 new boat just picked it up last Friday (1/15/10)"
06 150 Merc Motorguide TM. 60.5 mph @ 5450 rpm (gps). 10 225 Merc MinnKota Fortrex 101#. 74 mph @ 5400 rpm (speedo). 800 LXS DC 50 mph @ 5200 rpm (gps). 08 150 Merc Opti Motorguide 70# 24V. 58 mph @ 5700 rpm (gps). 96 175 Merc Motorguide Tour 82#. Coastal Edition MinnKota 80# Maxxum Pro US2. 52 mph @ 5400 rpm (gps). 02 115 Merc 55 mph @ 5000 rpm (gps). 96 150 Mariner EFI Motorguide 74#. Propshaft is 1.5" below the pad. 225 to kick it up a notch." 07 200 Merc Opti Motorguide Digital 82#. 884 DC MinnKota Edge 70#. 51.8 mph @ 6000 rpm (gps). 02 200 Merc Opti Edition 109#. 66 mph (gps). and a new steering cable." 09 250 Merc ProXS (speedo). 96 200 Merc EFI 65 mph @ 5750 rpm (gps). "Great boat! Holeshot is terrible. Does anyone have any advice?" stable ride. 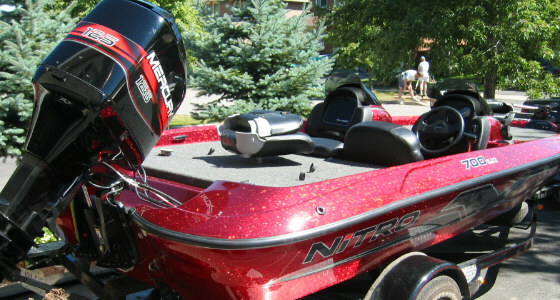 Full flake boat with custom colors, get a lot of looks." 99 150 Merc XR6 Motor is 2" above transom. 65 mph @ 5600 rpm (speedo). "Setting is not yet ready." 05 150 Merc Opti Motorguide Pro 70#. 68 mph (speedo). the pad. 71 mph @ 5750 rpm (speedo). 06 225 Merc Opti MinnKota 101# Max. 72 mph @gps). possibly a kit someone sells." 07 200 Merc Opti Humminbird, Motorguide 70#. 05 175 Merc to have the only Purple Nitro (with Silver and Black stripes). 94 150 Merc EFI 64 mph (gps). 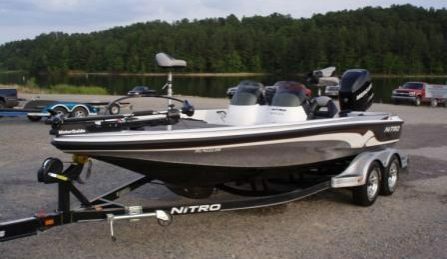 06 115 Evinrude Humminbird Matrix 17, MinnKota All Terrain 65#. E-Tec 47 mph @ 6000 rpm (gps). 05 150 Merc XR6 Motorguide Tour 70#. 61.4 mph @ 5400 rpm (gps). 99 115 Merc 38 mph @ 5600 rpm (gps). 05 90 Merc 47 mph @ 5400 rpm (gps). 07 200 Merc Opti Propshaft is 3" below the pad. 68 mph @ 5750 rpm (gps). 08 225 Merc Motorguide Digital 81#. 70 mph @ 5750 rpm (gps). colors separate but you cannot get them together in this combo." Rick Clunn Edition 52 mph @ 6000 rpm (speedo). 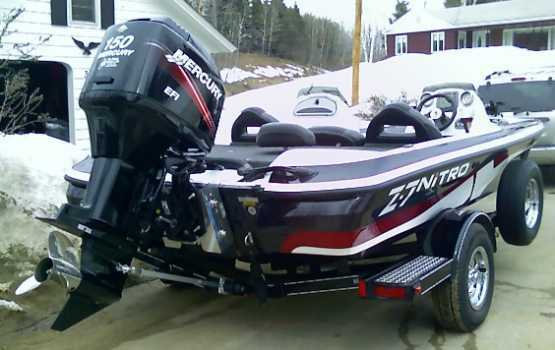 88 XP150 Evinrude Maxxum 80#. Magnum I'll be adding. I think I should be getting more speed." 07 150 Merc 50 mph @ 4500 rpm. 94 150 Merc XRi 68 mph @ 5900 rpm. "Hold On !!" 98 75 Merc Digital. 44 mph @ 5200 rpm (gps). 99 200 Merc EFI 67.2 mph @ 6000 rpm (gps). "Going to try a 25 Tempest next. Toying with idea of manual jackplate also." partner and their gear I'm holding steady at 54 mph at 5750 rpm. It's a litt slow out of the hole but hopefully a jackplate will help." 65 mph @ 5800 rpm (gps). 07 200 Merc Opti X96, Motorguide Digital Pro Tour 82#. 8' Pro PowerPole. Propshaft is 2.5" below pad. 73.6 mph @ 5450 rpm (gps). both, soon to be protected by Marineguard (and CCW). 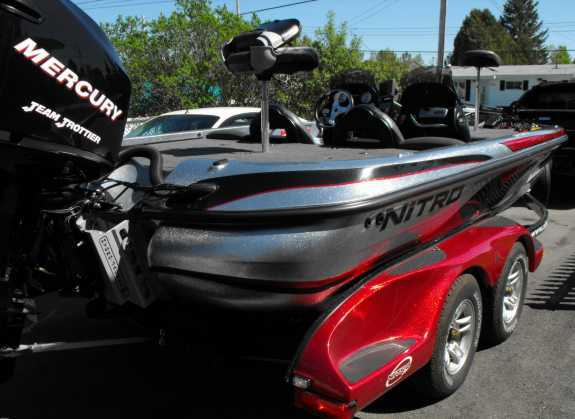 Going to try a 25 Fury and see if it's better." 99 225 Merc 70.1 mph @ 5900 rpm (gps). 08 150 Merc 62 mph @ 5300 rpm (gps). "CDC is the way to go. 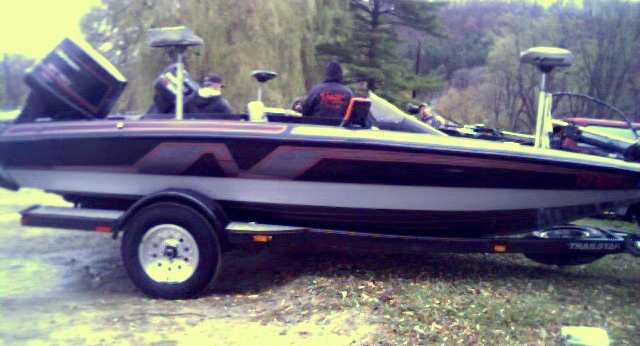 I love my boat." 06 115 Merc MinnKota Maxxum 74#. "I am still working on top end! 05 150 Merc Opti Motorguide Pro 70#. 68 mph @ 5500 rpm (speedo). "I love my NX882. For a boat just over 18' it fishes big. didn't for me. 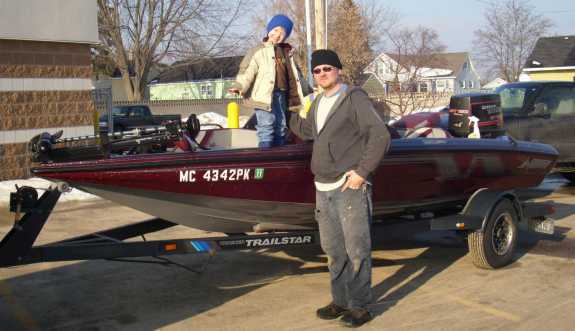 Overall this is a great boat." 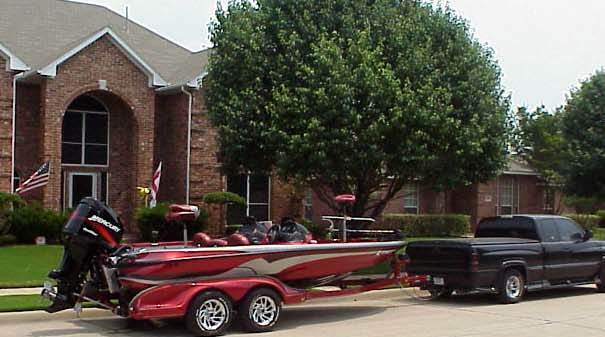 huge front deck and a lot of storage room." 07 225 Merc Opti Digital. 54 mph @ 5700 rpm (gps). 97 150 Merc EFI 62 mph @ 5500 rpm (gps). 08 250 Merc Motorguide TM. Propshaft is 3.5" below the pad. 72 mph @ 5900 rpm (gps). 06 150 Merc Opti TE782 VP. 58 mph @ 5450 rpm (gps). 99 150 Merc Motorguide Pro 70#. Propshaft is 4" below the pad. 66 mph @ 5800 rpm (gps). 94 115 Merc 55 mph @ 5900 rpm (gps). "She has never let me down." will add the wot speed and rpm after next week." 98 150 Merc Motorguide Tour ESP-FB 82#. 59-62 mph @ 5300 rpm (gps). Venom GT the low, runs great and very stable. Lots of room and storage. I'm still trying to get a few more rpms for a few more mph's." 01 225 Merc 71 mph (gps). 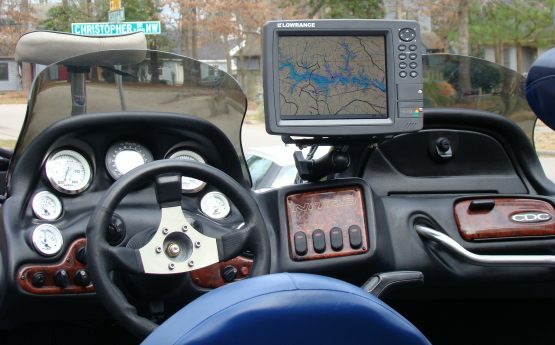 02 200 Merc Humminbird 565 (console), Motorguide 673. Propshaft is 3"
pitch & cup and adding 2" JP spacers to pickup a few more mph. Motor mods when new powerhead warranty expires." 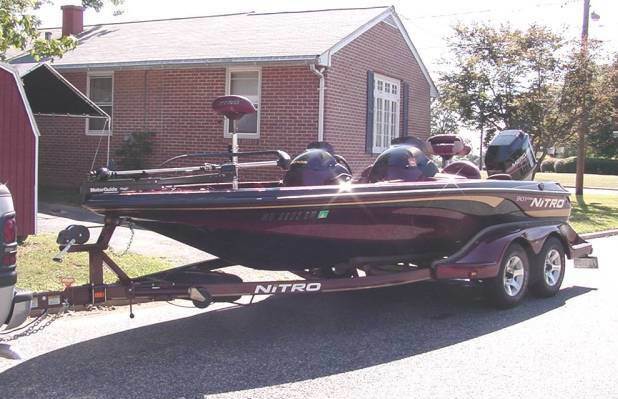 97 150 Merc "Just bought this boat recently, had it in the water a few times. 96 75 Merc bilge it bogs down a bit." 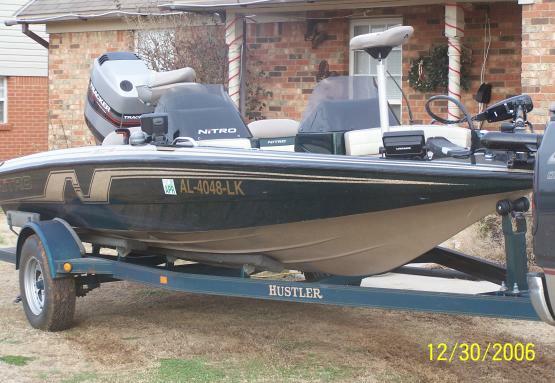 00 125 Merc Humminbird Wide Eye, Tracker 50# TM. 60 mph @ 5000 rpm. fast enough in a boat of this size." 96 120 Merc Propshaft is 3" below pad. 50 mph @ 5600 rpm (speedo). "Looking for more speed, considering a jackplate and a 26"
4 blade prop. If anyone has any suggestions please email me. I would like to see 60 mph." 97 75 Merc Propshaft is 2" below the pad. 47 mph @ 5320 rpm (gps). 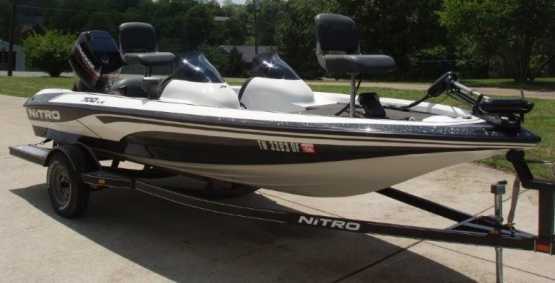 03 90 Yamaha MinnKota 55# All Terrain. 46 mph @ 6000 rpm (gps). range. Any advice would be appreciated." 06 115 Merc Opti FishElite 640C, Motorguide 71#. Propshaft is 4.5" below pad. Updated 11/29/09.... 64 mph @ 5200 rpm (gps). in the bigger more HP boats and I get major mpg's over them. 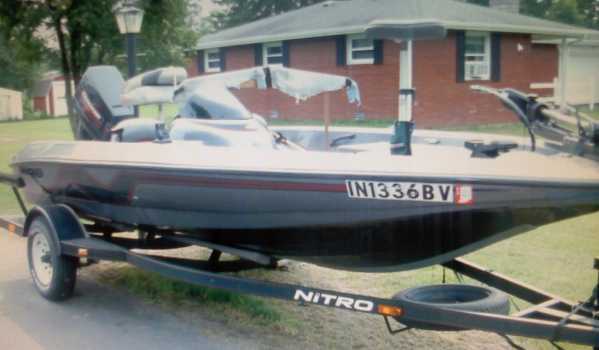 01 200 Merc Opti MinnKota 74#. Propshaft is 3" below the pad. 66 mph (gps). process of making changes, jackplate, prop and more electronics. Will update with new info." 06 225 Merc Motorguide TR109# FB Digital. side from my rod storage system b/c more rods fit like that. Overall a great deal! Engine is perfect!" 92 115 Johnson 46 mph (gps). 07 225 Merc 1440, MinnKota 101#. Propshaft is 3.25" below the pad. 98 115 Merc Motorguide 54#. 56 mph @ 5100 rpm (gps). Updated 5/8/07.... 56 mph (gps). fuel oil rations or injectors." comments or helpful hints for me please send me an e-mail." 02 115 Merc 55 mph @ 5400 rpm (speedo). suggestions on a good setup." reeds. Will update after installation next week." Updated 2/18/07... - Installed Boyeseen reed, noticed a huge different in cold start. 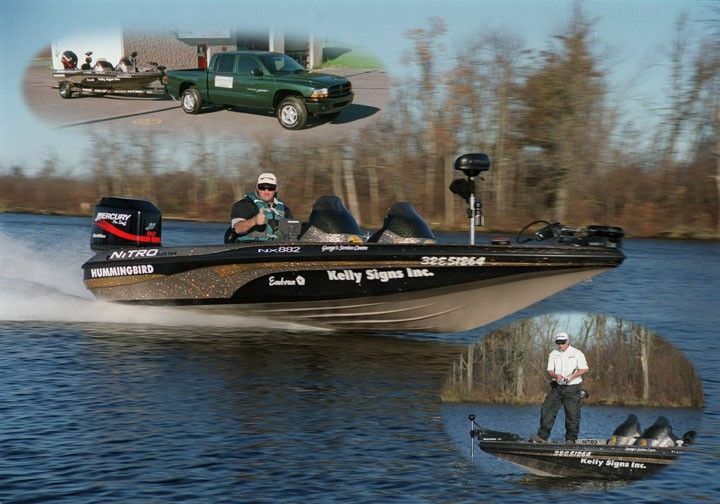 mph on gps but along with speed my rpms went up to 5700.
club tournaments and the small trails that I'm currently fishing." Mercury boat I've had so far, hope to keep this one for a long, long time. 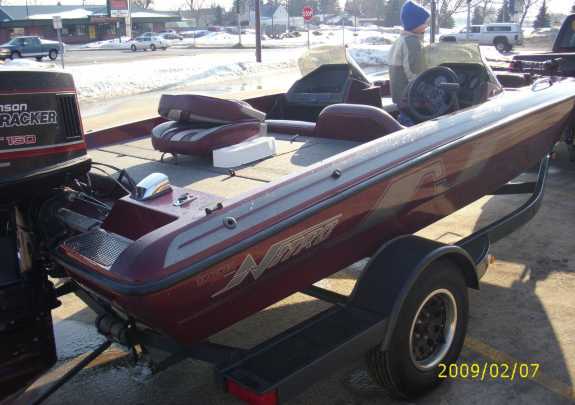 Needs new anodes, other than that it's in pretty good shape." 05 225 Merc EFI Motorguide 70#. 71 mph @ 5700 rpm. 05 150 Merc Motorguide Pro 70#. Propshaft is 4.25" below the pad. increased. Plan to raise engine one more bolt hole on jackplate." 03 200 Merc EFI 64 mph @ 5900 rpm (gps). 00 150 Merc Side Shooter, Motorguide TM. 63 mph (gps). relocator pin falling out of place an damagina the piston and head. Just got everything back together and runs great out of the water. in this forum or any other resources." 06 90 Merc 59 mph @ 5800 rpm (gps). Savage 896DC Brute. 72 mph @ 6000 rpm (gps). 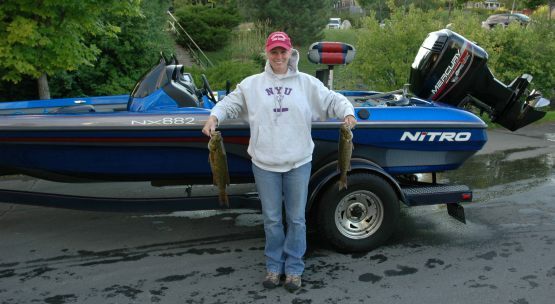 lot of nice bass with this rig from So Cal to Washington State." 07 200 Merc Motorguide digital. 74.4 mph (gps). 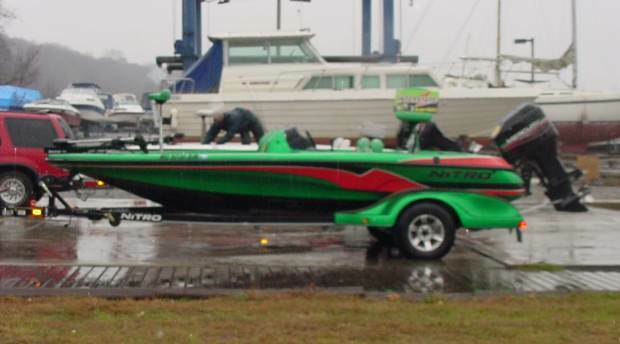 "This is a custom team boat. speed. Pics will be up after the wrap is done." 2 people, 1/2 tank fuel." 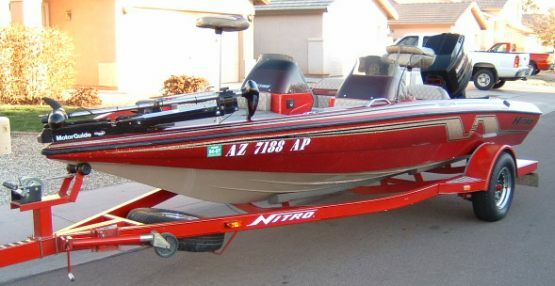 91 150 Evinrude MinnKota AP 55#. Propshaft is 3.75" below the pad. 56.8 mph @ 5200 rpm (gps). 88 150 Merc 55 mph. which helps this boat fly across the water!!" 06 150 Merc Motor is 2" off the transom. 67 mph @ 5700 rpm (speedo). point of being out of control. 67 mph was a very controlled boat. test out. Isn't that about the pitch this boat should have?" extra 12 volt plug up front. 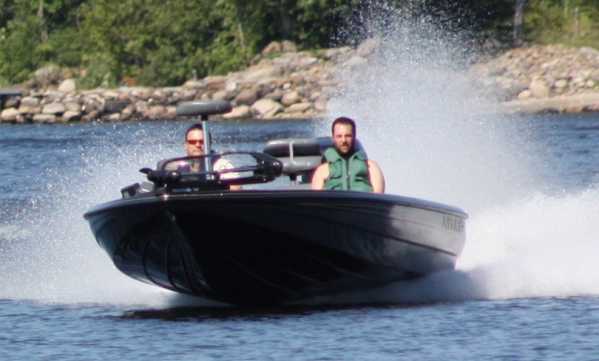 96 150 Mariner EFI 58 mph @ 5200 rpm (gps). 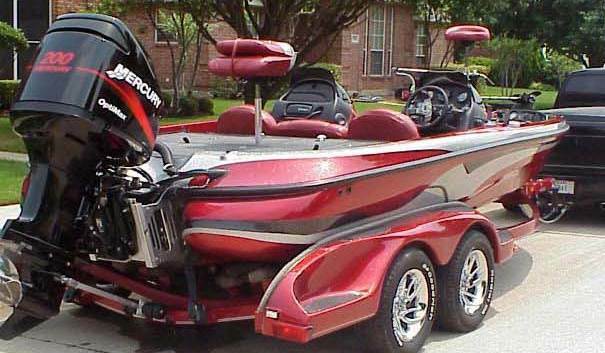 rough water boat with plenty of storage." 01 250 Merc XB 101#. 73.3 mph (gps). 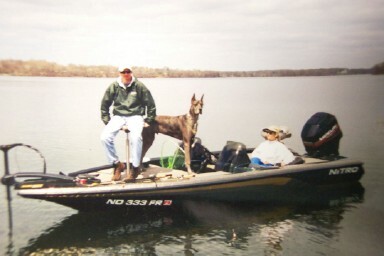 dog had a nice ride last week with room to spare." 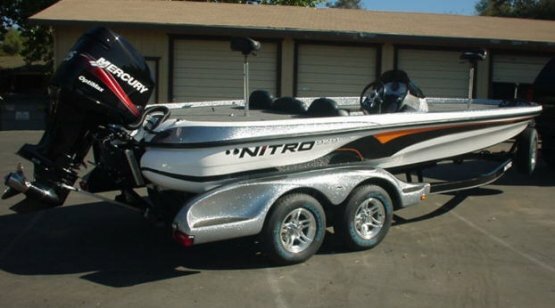 Nitro and fishing my first tournament in it this weekend. Rick Clunn 40#. "Just bought it and still cleaning, no pic yet." 97 225 Merc Propshaft is 2.25" below the pad. 67 mph @ 5800 rpm (gps). 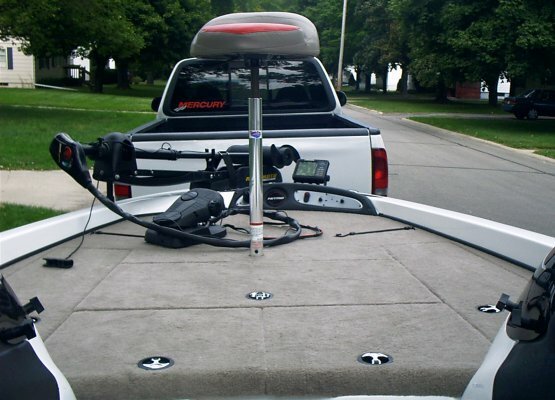 larger diameter for better bow lift." cooler water and cooler temp." measured propshaft to pad yet. Will soon!" very pleased with it so far. Looking to buy a jackplate for it. Any suggestions on what to get for this setup?" CDX DC 75 mph @ 5800 rpm (gps). 91 115 Merc 56 mph (speedo). 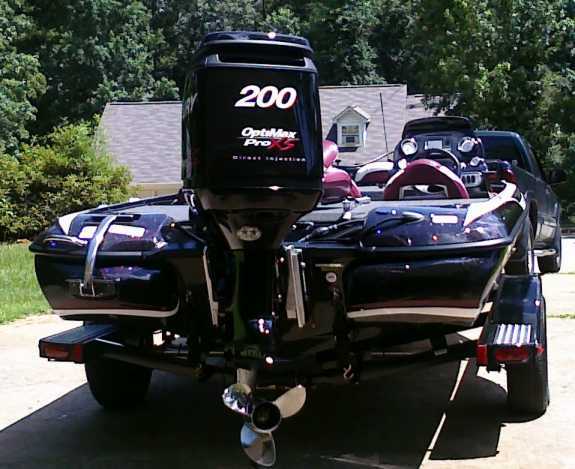 92 200 Evinrude 70 mph (gps). tournament load. Very happy with the boat." as good as this think looks and runs, look for me on ESPN. 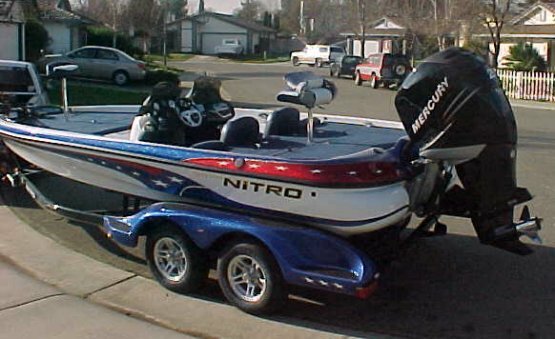 when I bought boat new didn't know anything about boat motors. 05 90 Merc Motorguide Pro Series 54#. 52-55 mph (speedo). 98 40 Force 28 mph @ 5600 rpm (speedo). Updated 3/24/06.... 5000 rpms and recorded a speed of 63.8 mph (gps). 03 225 Merc Motorguide 6700. 74 mph (gps). 05 225 Merc 71 mph (gps). "Electronics have been nothing but problems. 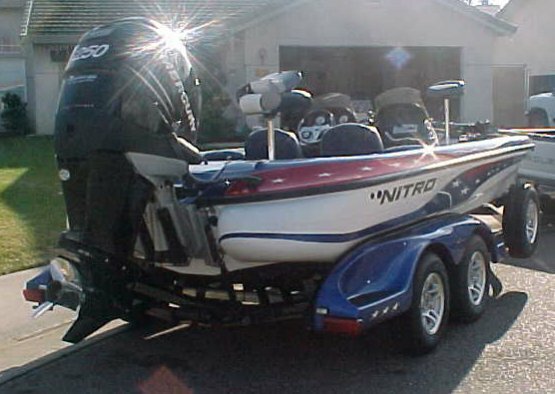 Love the boat, fishes great but is not the fastest on the water. 96 125 Merc Motorguide 67#. Motor is 2" above the transom. steering wheel, No Feedback steering, etc." measured prop to pad distance." 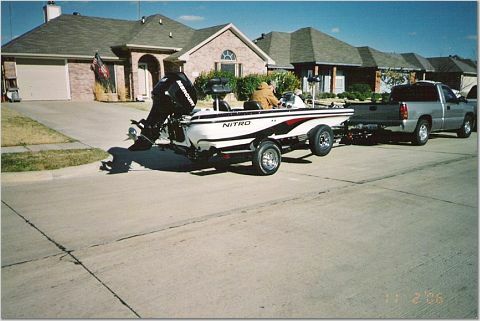 all around boat I have ever owned." 03 175 Merc Opti Motorguide TM. 61 mph @ 5400 rpm (gps). 94 40 Merc Tracker other owner's mess ups. Only had it on the water three times. fishing in. Love the boat so far." lists to the port side upon planing then evens out when trimmed. encountered anything like this. Feedback greatly appreciated." 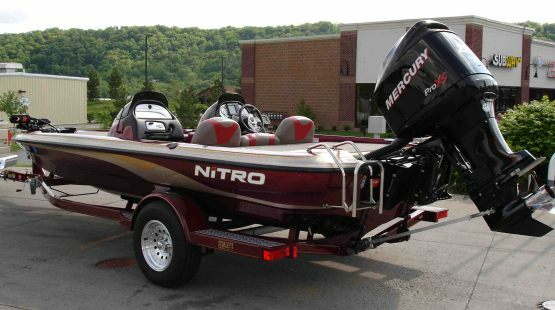 04 150 Merc 1440, Eagle Cuda 168EX, Motorguide Proseries 6700. 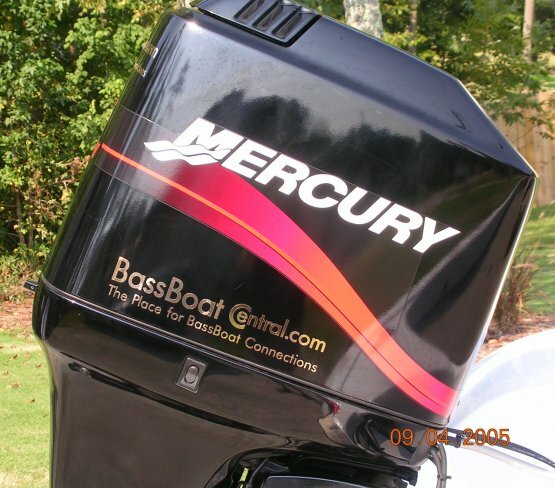 98 120 Mercury 120, Motorguide Brute 65. 52 mph @ 5600 rpm. 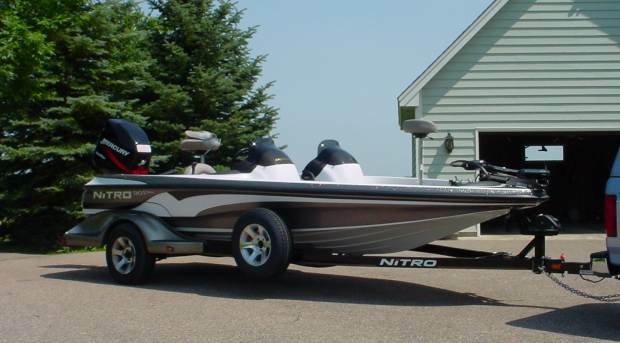 03 90 Merc MinnKota All Terrain 55#. 51 mph @ 5100 rpm (speedo). 04 150 Merc EFI Matrix 67. Motorguide 6700. 60 mph @ 6000-6200 rpm (gps). dealer, it came with a 23" prop and was unable to plane up. my motor is 5750 rpms. Any suggestions, please e-mail me. Jim"
00 150 Merc EFI "Extreme chinewalk." 05 150 Merc XR6 Motorguide Pro 70. 56 mph @ 5200 rpm (gps). Savage 61 mph @ 5800 rpm (gps). 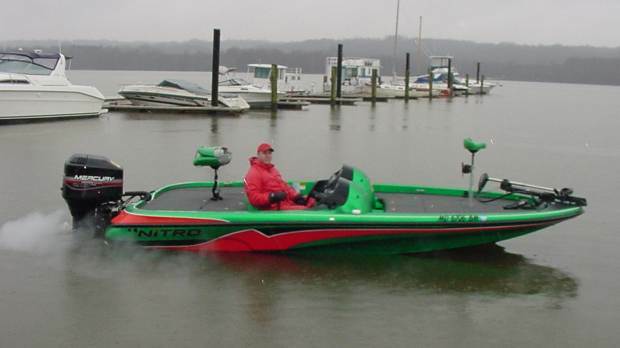 "I am very pleased with this boat. 05 150 Merc Motorguide 70. Motor is 3" above the transom. 67 mph @ 5300 rpm (speedo). "Drives like a sports car." 05 115 Merc Pro 6700. 42 mph @ 5950 rpm (gps). "Have purchased a 17"
extension. Makes a world of difference." 05 225 Merc 76 mph @ 5400 rpm (gps). for suggestions and what speeds and or setup should be." 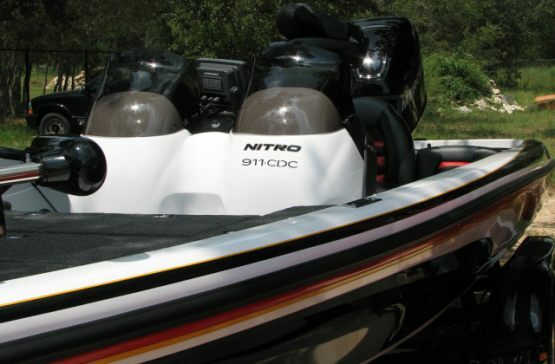 90 150 Evinrude XP 61.8 mph @ 5250 rpm (gps). 02 125 Merc Motorguide 767 Brute. Propshaft is 5" below the pad. 57 mph @ 5100 rpm (gps). Trophy big hub 22" this week to get rpms up." Spectrum and I'm happy as could be with the new boat. 00 200 Merc Opti 69.8 mph (gps). 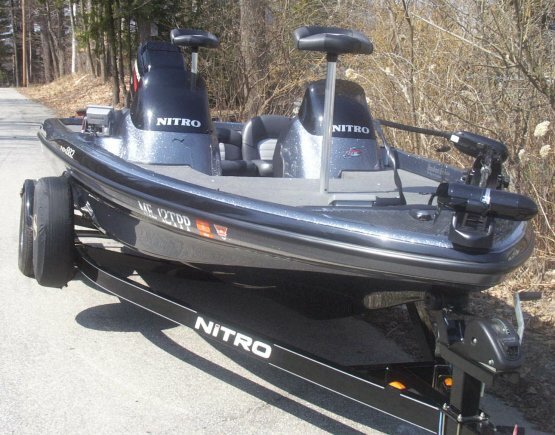 fishing inland waterways and lakes, handles well in wind." 04 200 Merc EFI ride. Need to work on set up." 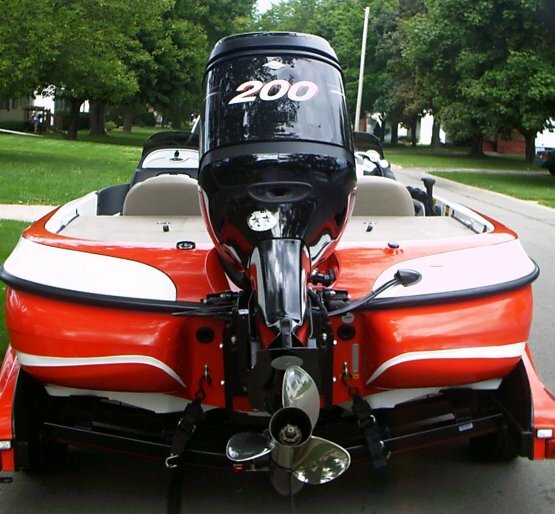 96 200 XP Evinrude 65 mph @ 6200 rpm (gps). Spring. Does take longer to get on the pad that I expected." person looking for comfort, speed, ride and stability." 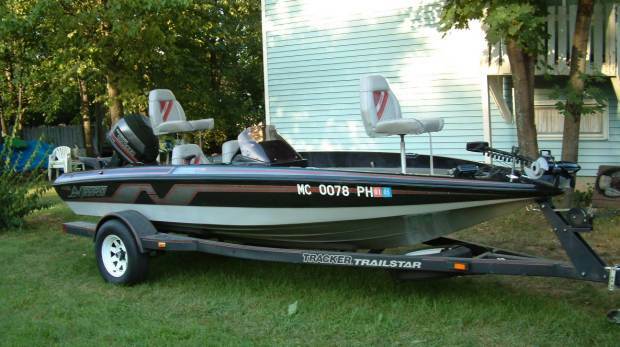 97 115 Merc (front), Humminbird 128 Wide (console), Motorguide 72# TM. 60 mph @ 5200 rpm (gps). 18' White with Green trim. 99 150XR6 Merc 59 mph (speedo). to work on setup, should run in the mid 70's no problem." 94 150 Merc Need more speed." 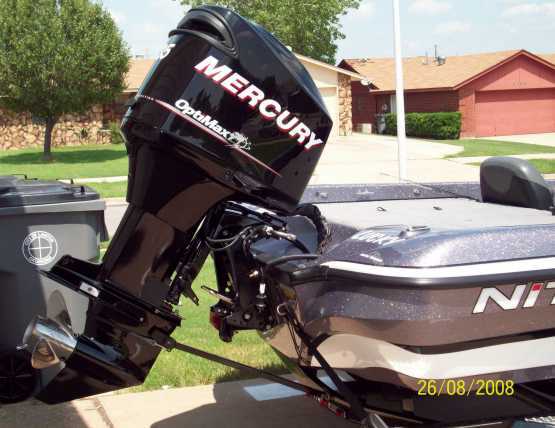 96 120 Mercury Motorguide ProSeries 41#. 55 mph @ 5150 rpm. 05 115 Merc ELPTO 60 mph @ 5100 rpm (speedo). 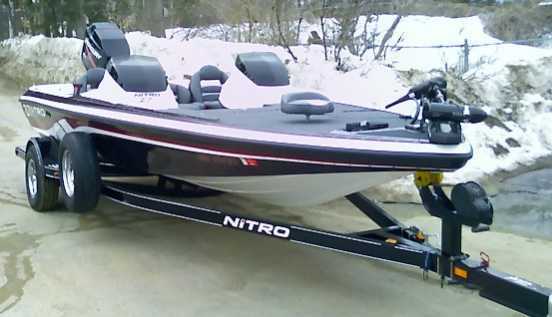 converting to fishing mode....boat's a gas." about it is that the Wife bought and paid for it! CDX - SST 65T. Propshaft is 4" below pad. 71.2 mph @ 5900 rpm (gps). 03 225 Merc EFI 69.9 mph @ 5750 rpm (gps). 93 115 Evinrude MinnKota Powerdrive 50#. 45 mph @ 5500 rpm (gps). "Looking to get a few more mph, any ideas?" 96 200 Merc 67-70 mph @ 6000 rpm (gps). 97 90 Force Motorguide 50. 50 mph @ 5200 rpm (speedo). "Anyone got original literature on this boat?" 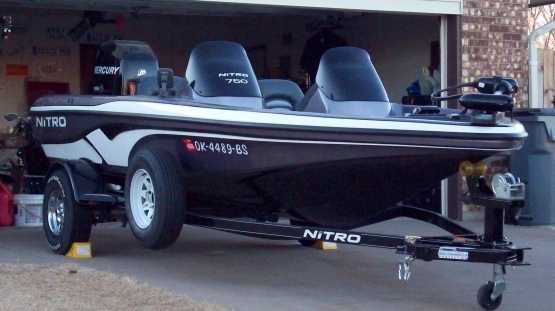 00 150 Merc MinnKota Maxxum 74#. Propshaft is 2" below the pad. 63 mph @ 5900 rpm (gps). soaked from the hose that popped off. The 200 never did that." 896 DC Eagle Intellimap 320, MinnKota Maxxum 74#. 99 200 Merc EFI 72 mph @ 5800 rpm (gps). "And they said Nitro's were junk! 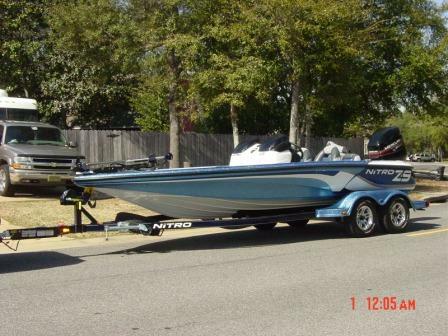 in a first time buyer, big water tournament boat!" 04 150 Merc XR6 XP4000, Motorguide Pro Series 6700. Propshaft is 3.25" below pad. 67 mph @ 5200 rpm (speedo). flasher, CD player, dual console. 00 100 Yamaha 52 mph @ 5850 rpm (gps). 96 200 Mariner Lowrance X70A, Motorguide ProSeries. Magnum EFI 67 mph @ 6200 rpm (gps). boat and motor. Will update with info and picture later. 96 150 Merc EFI Wide Vista, MinnKota Maxxum 74#. Propshaft is 3" below pad. front deck extension, Guest 3 bank charger, hot foot." Marine!! Looking for prop and jackplate." 98 150 Merc EFI Motorguide TM. tank of gas. Probably 75+ light." 03 75 Merc MinnKota TM. 55 mph @ 5200 rpm (speedo). "Thinking about a SS prop and a jackplate, wanted some input." CDX DC Motorguide TM. 72 mph (gps). 99 225 Merc Motorguide Pro 70 TM. 71.9 mph @ 5600 rpm (gps). Tracker Pro 47 mph @ 6000 rpms (speedo). 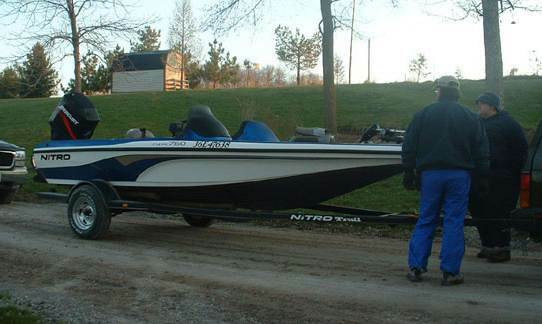 "Just bought the boat used. for performance enhancements would be greatly appreciated." 03 225 Merc Eagle Fish Elite 320, Eagle Fish Easy. Motorguide 67#. 68 mph @ 5200 rpm (gps). 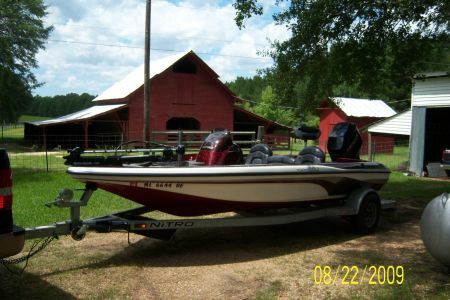 929 CDX DC Matrix 15 fishfinder, Motorguide 6700 Tour Series. 03 225 Merc Motor is 23" above the pad. 72 mph @ 5600 rpm (gps). 96 200 Mariner 72 mph @ 5800 rpm (gps). 02 150 Merc XR6 Motorguide Tracker Pro 60. 67.5 mph (gps). 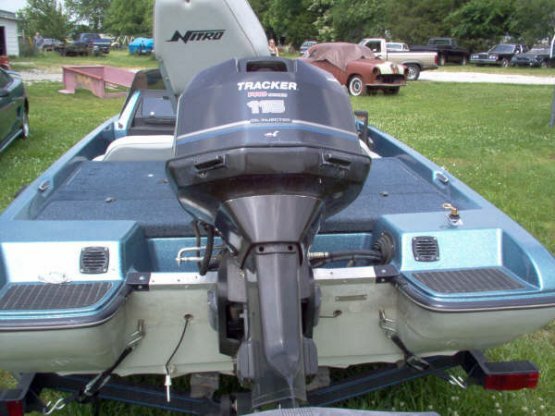 98 200 Mariner Pro 60, Motorguide Energy 60# 24V. 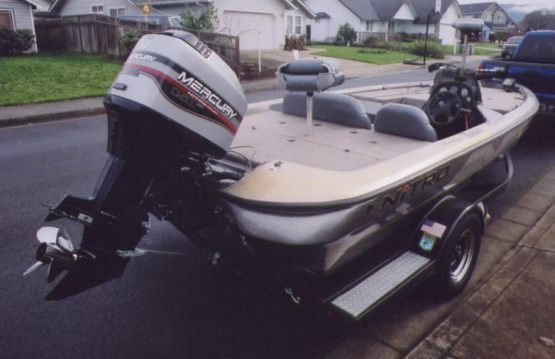 02 200 Merc Series, Eagle Ultra Classic, Motorguide 67# TM. Motor is 4" above the transom. 67 mph @ 5700 rpm (gps). friend and my nephew who is about 70 lbs lighter got 72.5". 97 150 Merc Series TM. Propshaft is 8" below the pad. the hole. Any help would be great." 03 200 Merc 74 mph @ 5200 rpm (gps). and go. Boat is running good and only running 5000 rpm. 03 115 Merc EFI MotorGuide 6700. 55 mph @ 5800 rpm (speedo). 4 Stroke "This is a new set up, still in break in hours for motor." 67 mph @ 5800 rpm (gps). Updated 7/11/03... 70 mph @ 5700 rpm (gps). 99 150 Merc Classic CID 40, Tracker Pro Series 60# TM. Transom height is 25". 74 mph @ 5800 rpm. 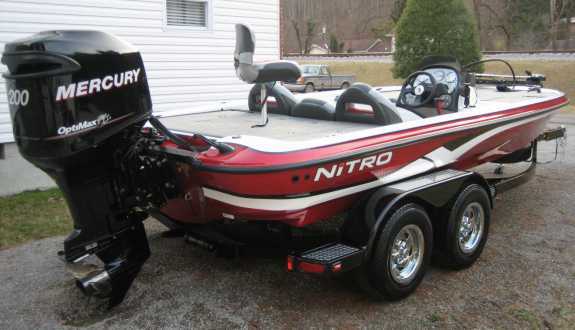 "I love this boat. I want to get a little more speed out of it. 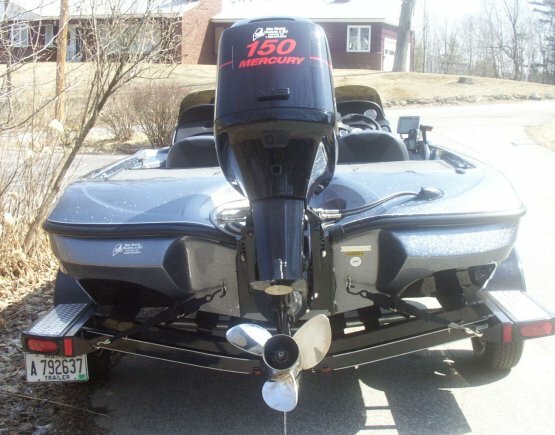 I may add a Mercury Optimax 175 hp." 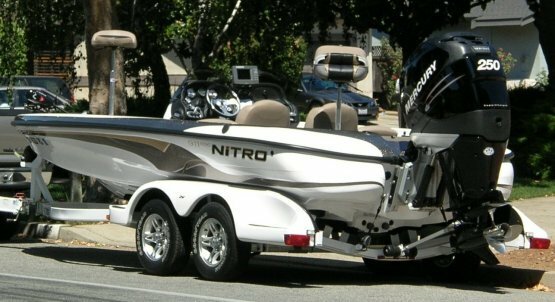 99 175 Merc EFI Lowrance X65, Motorguide Pro Tour 56 TM. 70 mph @ 5100 rpm (gps). LXS800 150 owners to discuss chinewalk problems." 97 125 Merc Motorguide Brute 756 24V. 51-54 mph @ 5200 rpm. CDX SC 74 mph @ 5900 rpm (gps). 00 125 Merc Wide 128 (console), Motorguide 67# TM. and stop chinewalk...any suggestions? " 97 150 Merc Motorguide Tour Edition 782. Propshaft is 3.5" below pad. 66 mph @ 5700 rpm (gps). "Recently dropped from a 25"
Tempest to 23". Much better hole shot, rpms and handling. Zercom RTS in dash, 2 Pinpoint finders networked." Zercom Classic CID-40 in-dash flasher. 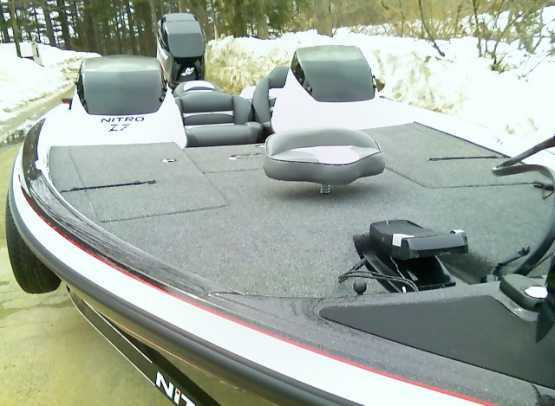 Updated 2/11/03.... MinnKota Maxxum 74#. 69.8 mph @ 5500 rpm (gps). the motor a little. Any advice is welcomed." as soon as the snow melts." 97 150 Merc Motorguide TM. 66 mph @ 5600 rpm (gps). reeds, eg., whatever it takes." 01 225 Merc Paramount, MinnKota Genesis 74# TM. 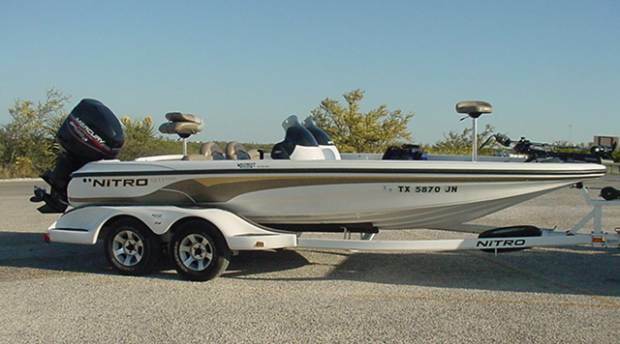 97 200 Merc transom. 81.67 mph @ 6800 rpm (gps). but she flies and I have no problem with helping any one here. The motor is not stock, but when it was it still ran 76 on the gps. 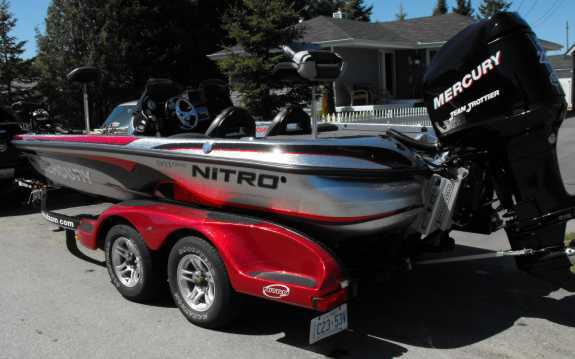 200 Merc Lowrance X75, MotorGuide Tour Edition 107#. 64 mph @ 5800 rpm (gps). 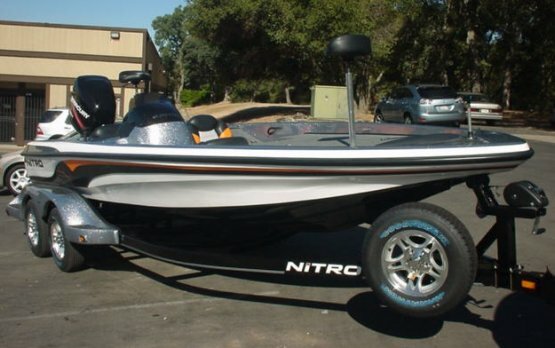 to 75 gps and I feel 69 is too slow for this boat." Optimax 62 mph @ 5400 rpm (gps). jackplate. Very poor out of hole. Takes long time to get on pad. sparkle will knock your eyeballs out." Fish/Ski finder, MotorGuide TM. Propshaft is 1" below the pad. Bob's stabilizer plate on or what?" 150 Merc 65 mph (gps). Mods include 200 xri pipe, Boyesen reeds, hot foot, trim button. 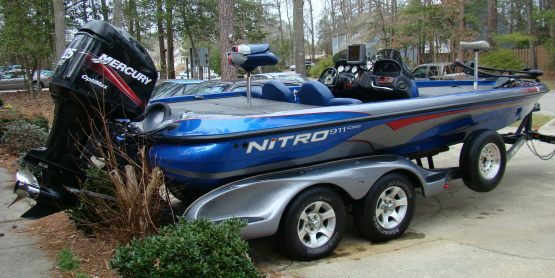 leave 80 pounds of extra tackle home..."
115 Johnson spend a lot of time on Lake Murray learning." another person to fish with." 72 mph @ 5400 rpm (gps). 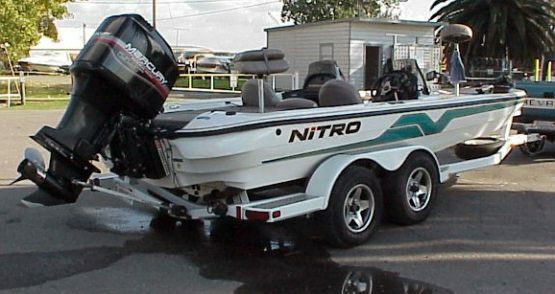 "This boat is flat out BADDD! 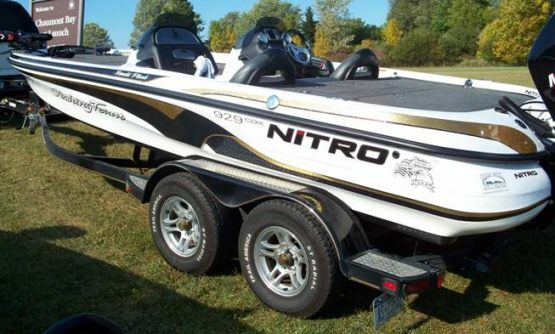 wants ultra shallow water running or pure performance." 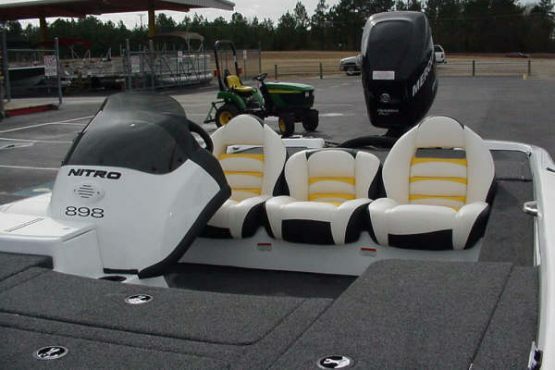 had all new carpet put in and a bimini top put on." 61 mph gps with a 150." 200 Merc Jackplate set up 5.25" above bottom of boat to cavitation plate. Optimax Getting ready to try a 24" Tempest to gain more speed. 150 Evinrude XP Eagle Mach 1 paper graph, Minnkota 74#. Propshaft is 3.5" below the pad. 62-64 mph @ 5500 rpm. could use another 50 horse." 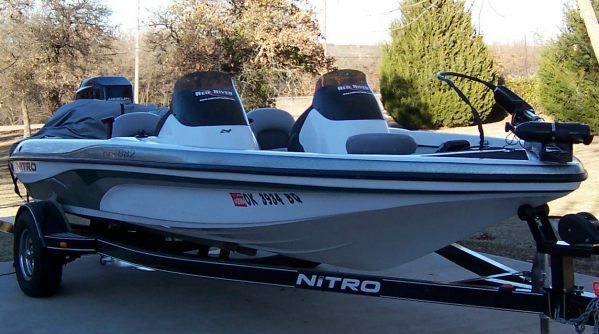 200 Merc EFI 10" jackplate, Minnkota Maxxum 74# TM. 68 mph @ 5800 rpm (speedo). 896 DC MotorGuide Tracker series TM. 63.8 mph @ 5400 rpm (gps). would love to hear about them. 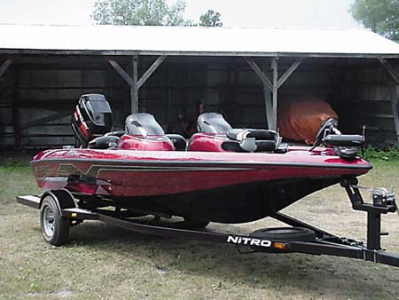 This boat rocks in rough water." 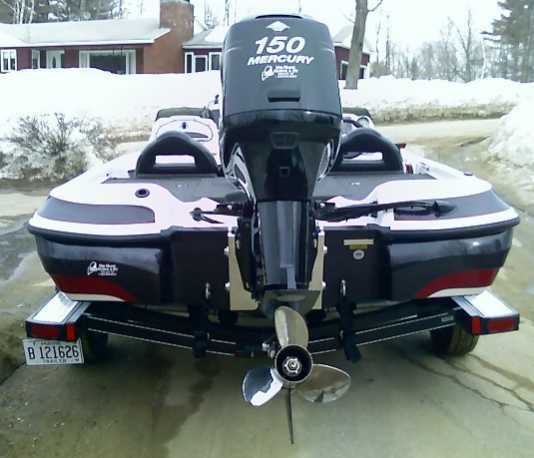 150 Mariner EFI 128, MotorGuide 50# TM. Propshaft is 3.5" below the pad. finding props to test. Holeshot is a little slow with the 26"
Chopper. I am thinking a 26" Trophy will make it run better." Updated 6/14..... "I finally found good prop for my boat. 27" Mirage. engine height a bit to see if there is more performance to be had. Pics are hopefully coming soon...."
150 Merc EFI open it up." 225 Merc EFI rough water. 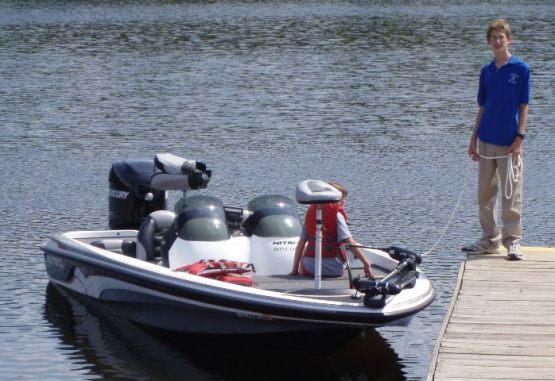 Oklahoma lakes are fairly shallow & windy." 200 Merc MotorGuide 76# Energy TM. 78 mph @ 5600 rpm (speedo). 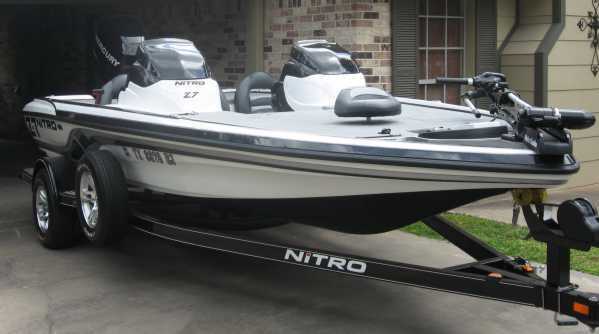 98 Nitro 884 Savage 25" Tempest Plus, Lowrance X75 (bow), Lowrance X65 SkUmFrOg - ? 150 Merc EFI (console). MotorGuide TM. 65 mph @ 5500 rpm. 175 Merc-Nitro (gps). 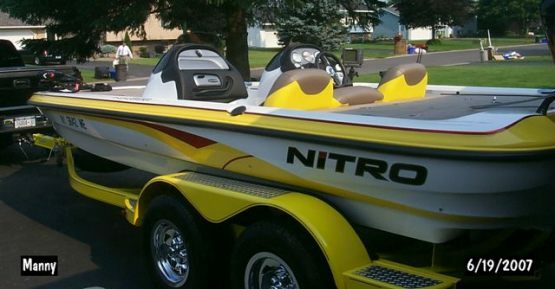 "The Best Riding and Priced 18 ft. boat on the market. 120 Force 60 mph @ 5300 rpm (radar). Optimax for fishing only. Top speed on GPS was at Lake Havasu, AZ. was at 70. Just bought the GPS, spent rest of the week fishing. in for everybody back east. I usually run it at 4200 rpms. 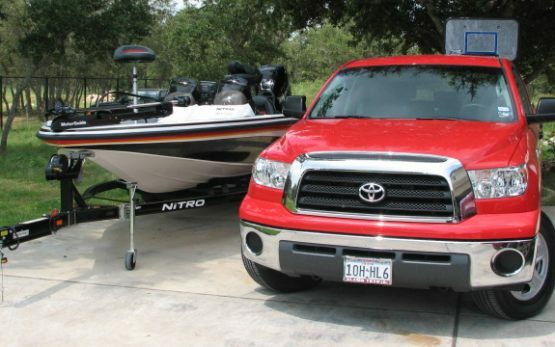 Good boat and great motor." 150 Merc Humminbird WideOptic, MotorGuide 65#. Propshaft is 1.75"
every day from dawn till dusk. FISH ON !!! 90 Merc MotorGuide 43# TM. 50 mph @ 5400 rpm (gps). first REAL boats and has the lines you don't find anymore. at the time, so it's a struggle to keep the oxidation away." 93 200GT Johnson 72 mph @ 5500 rpm (gps). 75 Merc 51 mph @ 5800 rpm. 150 Merc MotorGuide 767 Brute 24V. Propshaft is 1.5" below the pad. 71 mph @ 6700 rpm (gps). "This motor has been slightly modified." 150 Merc EFI MotorGuide 36V TM. 65 mph @ 5600 rpm (gps). 150 Merc EFI MotorGuide 56# TM. 68-70 mph @ 5500 rpm (speedo). going to try to get it a little faster. 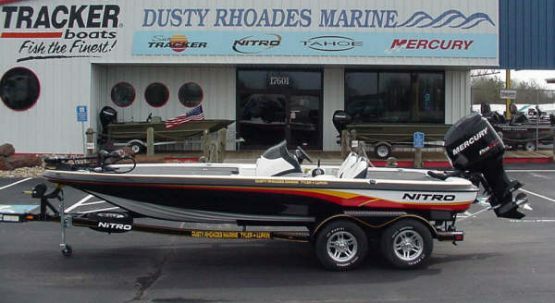 Boat is Onyx Black, Yellow stripe, solid Black hull. 150 Merc XR6 Tracker 60, 56# TM, Propshaft is 1 1/2" below the pad. ride and lots of room." tandem w/brakes. 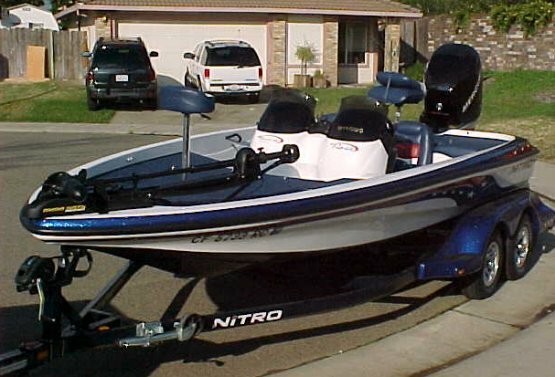 Great handling boat and fishability. 75 Tracker 47 mph. "Boat handles real good." 90 Merc MotorGuide 43# TM. 53 mph @ 5800 rpm (gps). and pointers on gelcoat repairs." Fastrike (93) wood from Old Hickory for 2 years now." Rick Clunn Ed. 43 mph @ 4800 rpm (gps). 150 Merc Tracker Pro Series TM. 68 mph @ 5300 rpm (gps). trolling battery to cranking battery). Front deck extension. 46-50 mph @ 5200 rpm (speedo). 150 Merc Wide Portrait, MotorGuide 12/24 756 TM. Optimax 62.3 mph @ 5500 rpm (gps). Predator. "Sweet rig & setup. Wouldn't trade it! Motor perfect. 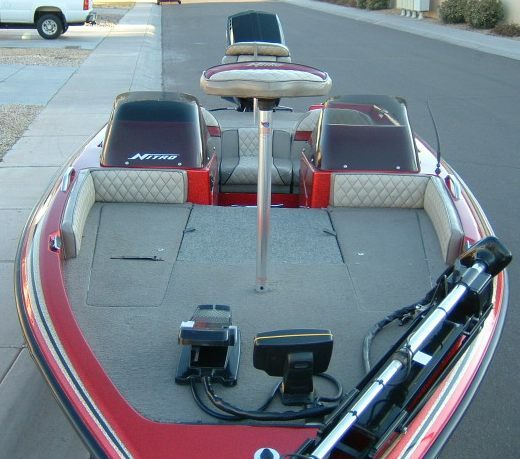 Red stripes, grey hull/carpet. No feedback steering,no torque!" 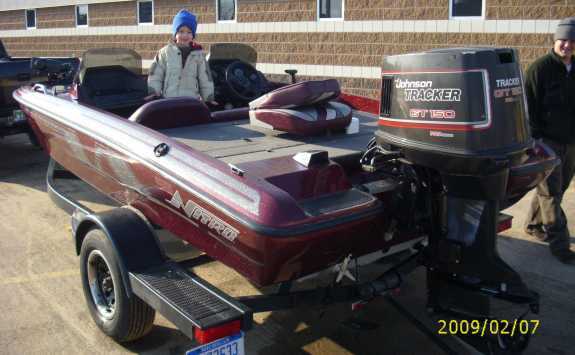 Updated 2/19/02 boat but bigger jackplate that I could compare with." 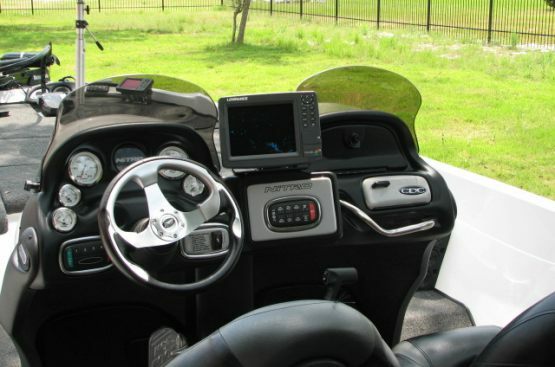 200 Mariner MotorGuide 67#, 68 mph @ 5600 rpm (gps). 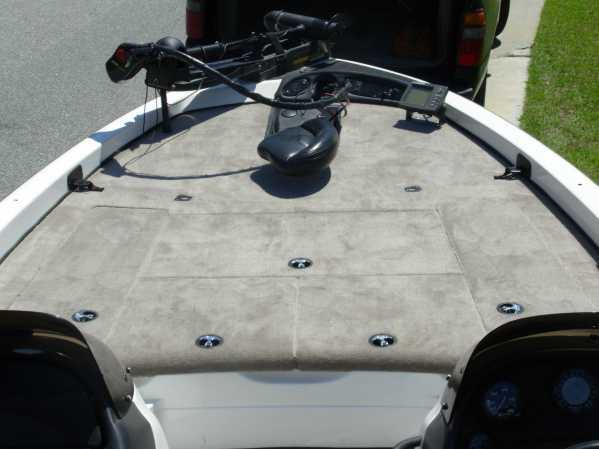 Optimax charger, custom in-compartment lighting, Osprey rod storage. 62 mph @ 5900 gps. Burgundy/Silver/White w/grey carpet. 225 Merc 68 mph @ 5800 gps. 115 Johnson 56 mph (gps). 200 Merc Optimax MotorGuide 67# TM. Propshaft is 26" from bottom of bracket. hour meter myself. Runs like a top!" Added rod holder, hotfoot and custom cover. 200 Optimax Lowrance 1240A flashers, X65, Zercom LPG2000. 120 Force Guest 2 bank charger. Ice White cap/hull with silver/red stripe. 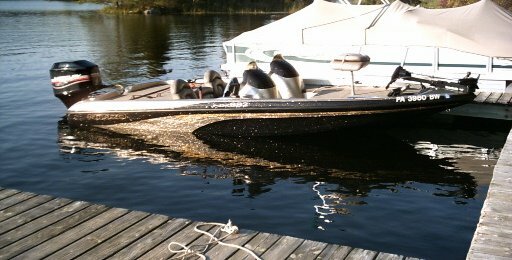 175 Intruder Minnkota 74# TM. 150 Johnson GT Lowrance X70A. 150 Johnson F/strike more speed." Savage 884 SC Dual Pro charger. White w/burgundy stripes. 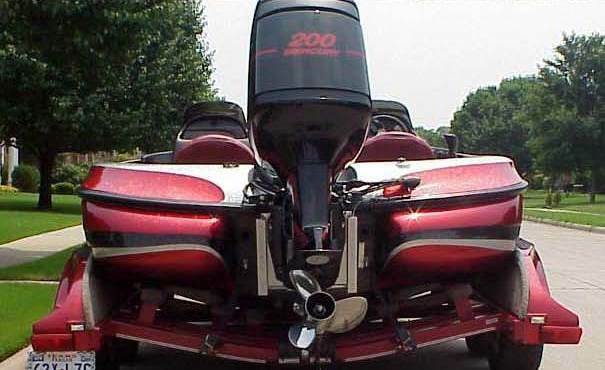 115 Evinrude 120 ID. Original owner. 150 Intruder hot foot, trim on wheel. "The best part - no payments."